I had this post almost finished and ready to go, and then Mitja tried to start the car and it made all these funny noises and it smelled bad and suddenly we’re calling road assistance and the car gets towed to the mechanic’s and I’m on my edge. I hate these unexpected unpleasant events and ever since the brakes blocked while I was driving and the car started smoking up (this happened a few months back) I freak out at the slightest weird noise. These events are always unpleasant because usually, they happen at an inappropriate time, when you’re in a hurry or when you really need the car… and it always ends up costing quite a lot of money. Plus, they trigger an irrational fear in me that shakes me up for the rest of the day. But, such events are exactly why we pay for road assistance, that has been a blessing a few times so far. So at least we don’t have to worry what to do when we are stranded on a mountain pass with summer tires and sudden heavy snowing (which, btw, totally happened). My go-to stress-release method appears to be cooking. And while I cannot eat while I am so stressed, I do find it relaxing to mix ingredients and watch them turn into something delicious. 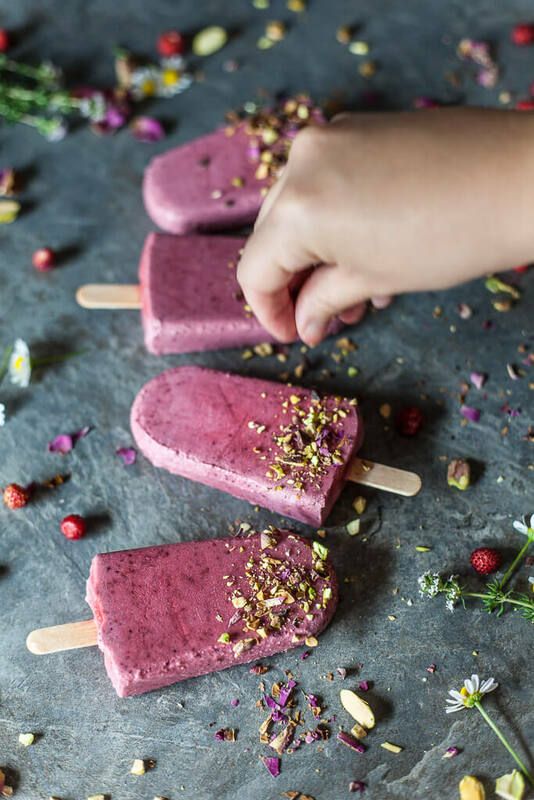 These Wild Strawberries Coconut Milk Popsicles are made with just 3 ingredients. You put everything in a blender, blend, pour into a popsicle mold and freeze. And there you go: 3-ingredient blender popsicles with wild strawberries, coconut milk, and agave syrup. And you can totally use regular strawberries or even blueberries or raspberries! These Wild Strawberries Coconut Milk Popsicles are light, delicious and a real summer treat. Vegan and gluten-free! Wash and dry strawberries, remove stems as needed. Place them into a blender, add coconut milk and agave syrup and blend until smooth. Pour mixture into a popsicle mold, add pops holders and place into a freezer to freeze for a couple of hours or overnight. When the popsicles are frozen, remove from freezer and the mold. Try running water over the mold if the popsicles are stuck and gently move them around until they give in and you can get them out of the mold. 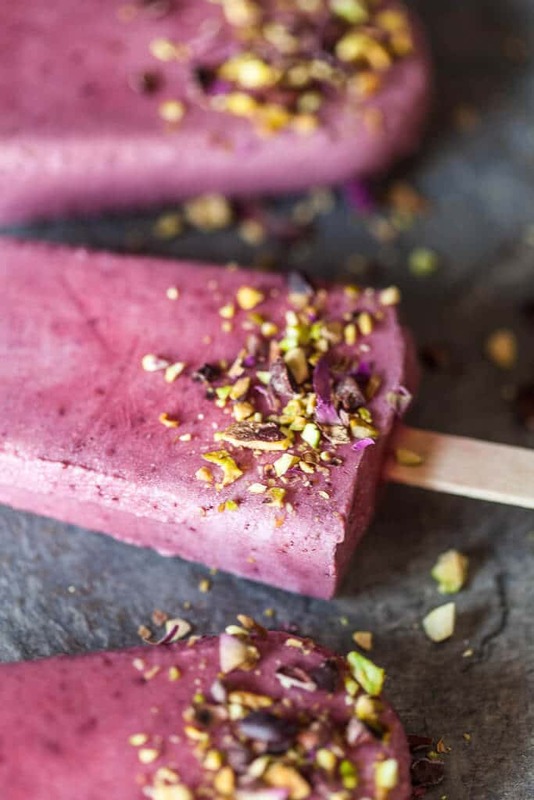 Top popsicles with chopped pistachios, rose petals and cacao nibs and eat immediately. 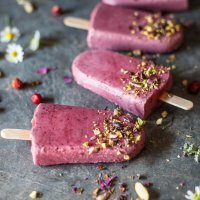 I love these simple to make desserts that are so perfect for the hot summer days, and only 3 ingredients to make such a beautiful looking popsicle! Impressive. Love that these are so natural! They are pretty! Hi Jane, thanks for reaching out. Actually, yes. Organically produced roses ARE actually edible. The rose petals I used come from actual dried roses buds, cultivated organically for tea. I did not buy roses in a flower shop and I highly recommend using only roses that are suitable for consumption. I got my dried rose buds in an organic shop in the spice section. I am updating the recipe for clarification. 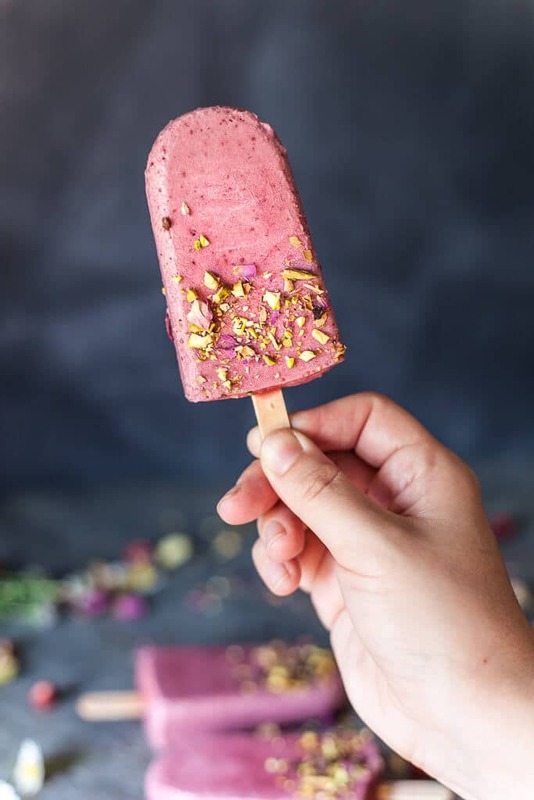 I would also add that the rose petals are not essential to the recipe and you can absolutely skip it and still get amazing popsicles 🙂 Hope this answers your question! can the coconut milk be replaced with almond milk? Hi rama, it can but the taste and texture will not be the same. I would suggest you replace the coconut milk with something with more fat than almond milk, or perhaps some plant-based natural yogurt.